I’ve previously driven and reviewed the car – and you can read and watch that here. Having driven early gen examples of the world’s most well-known hybrid car, I was very impressed with just how far the latest edition had evolved. And how much a painless and no-compromise car it had become. So clearly it was time to find out how it works as a daily driver. Our car arrived from Toyota Dubai dealer Al Futtaim with around 15,000km on the clock. Last week with the Prius. I’ve done 1600km and filled it up twice (there’s still half a tank in there) – basically spending only AED10 for every 100km driven. So here’s a round up video in which I respond to some of the comments I’ve had over the last four weeks. Below is the text version and this week’s posts! Well at least it’s not bland. Toyota has often been criticised for coming up with bland-looking cars, the Prius certainly can’t be accused of that. It’s very distinctive and it’s lower, wider and longer than the previous model with the driver sitting closer to the ground. But it’s all about aerodynamics and they’ve managed to get the drag coefficient down to just 0.24 – the same as a Tesla Model S! Not really. It’s actually par with other cars of this dimension and with the same sort of engine size – about 120bhp. Acceleration is 0-100kph in 10.5 seconds and it’ll reach 180kph. More significantly I’ll wager that it’s initial off-the-line acceleration – thanks to the help of the torquey electric motor is slightly quicker than average. Well actually it’s a great size for a small family car that lives around town. The Toyota Corolla dimensions make it easy to slot through traffic and into parking spaces – it also helps that it has a reversing camera. Inside they’ve freed up boot space – expandable thanks to folding rear seats – by moving the battery pack under the rear seat ahead of the fuel tank. My family of four has never complained. This car has a whole new chassis, that battery pack being down there, lowers the centre of gravity – what do racing cars have? Lower centre of gravity. It’s a lot stiffer too, so better body composure. The suspension has been improved not just for ride comfort but for sharper more satisfying handling and there’s an accurate and well-weighted steering. Er… climate control, touch-screen interface, and a fantastic stereo thanks to JBL speakers. There’s even a heads-up display on this range-topper which takes care of any doubt about the centrally placed stack of instruments. The only thing missing are alloys – but you can easily swap out the steelies for something of your own liking – I’d suggest something quite sharp and rakish. Nonsense! The battery pack is designed pretty much to last the lifetime of the car. It’s under warranty for 8-10 years (depending on market) and up to 200,000km. In actual fact it’s intended to last a lot longer than that. It’s telling that at 12 years old, only 5% of Prius have had to have their battery change and they’ve mostly been either taxis or because the battery was damaged in an accident or collision. The cost of changing a battering is around $3000. Okay, it starts at AED89,900 and rises up to AED97,900 for this model (which is really worth the extra money. On average that’s about 20k more than similar cars like Corolla, so on the face of it, it is definitely more expensive at the point of purchase. However, remember that this thing uses less than half the fuel consumption of a Corolla. Say you do 25,000km a year, you’ll save over AED5000 a year and by the five-year mark you’ll have recovered the extra cost. So it does make economic sense. Here’s the real clincher though – in the same time, you would have put 7.5 TON of less Carbon in emissions – for which the environment and your children’s health, will thank you. 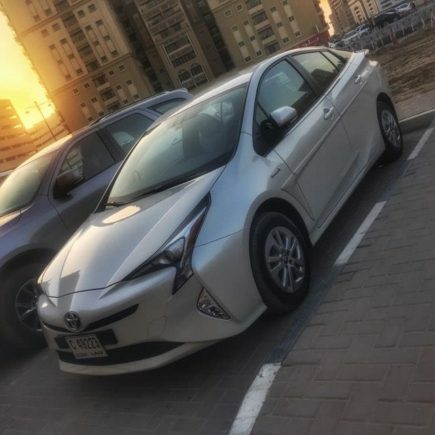 This week I set out to see just how economically they Prius could be driven on Dubai roads and what I could get my L/100km figure down to and what I ended up doing was proving that 200km in this car could cost just AED13.60. And less than AED80 will get well over a thousand kilometres! With the fuel gauge showing 1/8 of a tank left, I filled up again costing me AED59 – about 33litres of regular 95Octane petrol. Driving it 56km from my place in Al Nahda 1 to Jebel Ali, having put it in Eco Mode which simple reduces the responsiveness of the throttle and cuts down the energy consumption of the Air Conditioning system, plus employing fuel-saving driving techniques, I actually got my consumption down from my regular 5.4L/100km to just 3.4L/100km! I carried on a bit further to see if I could get it down more, but the pace of motorway traffic mean that this would be the best I could achieve. On the return leg I picked up the pace a little and started driving a little more normally. That still only brought my average economy figure up to 3.8l/100km, with the total mileage at 185 by the end of my run. According to my maths the trip cost me AED12.58 with petrol at AED1.79 per litre in total. This means with a 43litre fuel tank, if I could have maintained 3.8l/100 – which I think is quite doable if you’re gentle – it would have been possible to do over 1100km on tankful (costing about AED77) WOWSERS! Additionally it’s worth noting that the low-emission environmentally-friendly Prius put out about 13kg of CO2 into the atmosphere; by comparison a Camry would have put out over 22kg. Money saved AND clear conscience! Next week though – I’m putting the hammer down again! So far so good. I’m loving the drive, the practicality and the economy. Watch my Week 1 video post report below and scroll down for the week’s other posts.